The remains of an ancient musical instrument which lay undiscovered for centuries at the bottom of a Perthshire loch will help reveal secrets about Scotland’s prehistoric social life. The notched wooden object, believed to be the bridge from a plucked string instrument which dates back to 500BC, has been described as an “internationally significant” find. 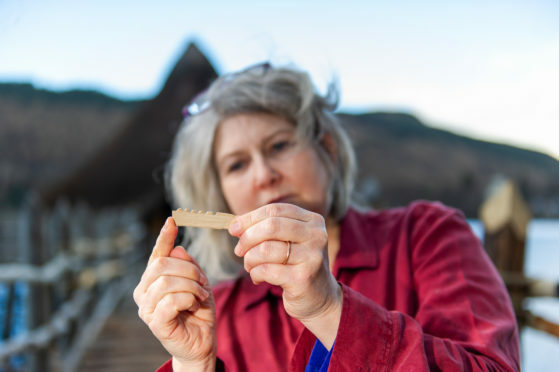 It was uncovered during an underwater excavation at Fearnan, on the banks of Loch Tay, and is thought to be a piece of one of the earliest musical instruments ever found in western Europe. The Scottish Crannog Centre, a living history museum at Kenmore, has launched an investigation into the item’s origins, with the help of £34,100 from the National Lottery. The heritage project – dubbed The Bridge That Connects Communities 2,500 Years Apart – will run throughout the year. Using the bridge as a launchpad, the wide-ranging study will explore how important music was to local communities during Iron Age. The centre, which became an accredited museum in late 2017, will examine the era in a series of workshops, talks and courses. The centre tells the story of the original Crannog dwellers, one of whom left behind this tantalising fragment of a musical instrument. The bridge was submerged in the waters of Loch Tay for about 2,500 years before it was recovered. It has been described by cultural historian Dr John Purser as “a find of major and international significance” and is thought to be a contemporary of a bridge found at High Pasture Cave on the Isle of Skye in 2012. Crannog director Mike Benson said: “We are delighted to have received this grant from the Heritage Lottery Fund. A replica of the bridge has been produced by Marco Gilardi of the University of the West of Scotland, which is backing the project. Last year, the Crannog Centre secured £25,000 from Museums Galleries Scotland for a refurbishment. The work will allow the visitor attraction to properly display items from its collection, including a fragment of cloth believed to be one of the oldest examples of textiles in Scotland.